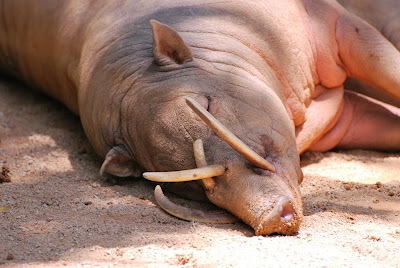 Aw, look at the little babirusa sleeping. How sweet is that? Look at the naked, wrinkled, porcine flesh as it naps in the shade. How about those elfin, bat-like ears? Oh, and those precious teeth, with the upper tusks thrusting through the flesh of the snout? Seriously, just like seeing a child who has been misbehaving all day fall asleep and you're reminded of how much you love them, so it is when you see this pig at rest. Why do those teeth grow through the snout like that? If you talk to the natives of the small tropical Indonesian island of Sulawesi, it's because the pig likes to rest his head by hooking the tusks over low hanging tree branches (I could use tusks like that...). Or perhaps the tusks curve back like that to protect the eyes and face from the lower, slashing tusks of rival males. Whatever the reason, take a moment and look at your own teeth in the mirror and take some consolation from the fact that no matter how gnarly they are, how much like baked beans or candy corn they may look like, not one of them has grown through your nose and is now protruding over your eye. First of all, congrats! for being "Blog of Note" for 19th November. Nice blog you have, interesting creature and rightly termed as ugly. Most of these; i've seen first time. Scary teeth, or tusks ! What a cute beast ! I am really surprised. I thought it is dead but it is just sleeping. it's really amazing that teeth grow through the snout~wow! i seem to remember reading something about those tusks eventually growing through the skull into the brain cavity, effectively killing the animal. i can't confirm that, though. Coincidentally, when I looked at this poor fellow's tusks, the ad above the post was about tooth whiteners. Wow - that is weird, the way the tusks have grown through the snout. It is neat to have a chance to learn about such interesting and bizarre things. Thank you. Congratulations of being blog of note! Nice concept for a bloggy. Great Blog! Funny Too. Congrats on being Blog Of Note too. that teeth is abnormal growth. it is not normal. maybe they have evolve or something. Your blog attracts readers and viewers for a variety of reasons. With time and caring, we can see beauty in the objects that we find very repulsive at first sight, and see ugliness in the most beautiful when we look inside. Congratulations on being a blog of note. Diane (D M Solis) should follow the link regarding the Babirusa. This is a perfectly normal, healthy animal. No one need worry! my kids were with me when i opened this pandora's box of a blog!and though there were a lot of eeewws and yucks and eeeks.they really loved your blog.so we have decided to become followers,o master of all things ugly.hehe. It makes me look very handsome indeed. check out my blog, and get free ebook daily. Do those keep growing? and if so - won't they eventually hit the snout and push against it? Wondering if they keep these sharpened some how. Very intriguing!